If you are looking for a free video converter that can convert MKV file on Mac, MacX Free MKV Video Converter would be your best choice. As a completely free yet feature-rich MKV video converter for Mac, it can convert MKV to any formats, such as MKV to MP4, MKV to AVI, MKV to MOV, FLV, MP3, etc at fast speed and high quality. So you can upload favorite videos, edit converted video with iMovie, or transfer to iPhone, iPod, iPad, Apple TV, Blackberry for playback anywhere. 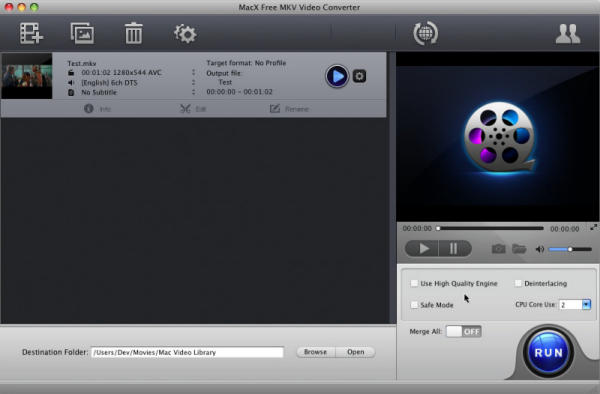 Moreover, this free Mac MKV converter also brings you great convenience to extract audio/image and clip video segment from MKV video as you like.